President Barack Obama walks into the National Shrine of Our Lady of Charity accompanied by its rector, Father Juan Rumin Dominguez. The president made the unscheduled stop May 28 before leaving for the airport. He had just visited the National Hurricane Center in Doral. President Barack Obama walks into the National Shrine of Our Lady of Charity accompanied by its rector, Father Juan Rumin Dominguez. The president made the unscheduled stop May 28 before leaving for the airport. He had just visited the National Hurricane Center in Doral. President Barack Obama greets people praying at the National Shrine of Our Lady of Charity during a brief, unscheduled visit May 28. At right is the shrine's rector, Father Juan Rumin Dominguez. 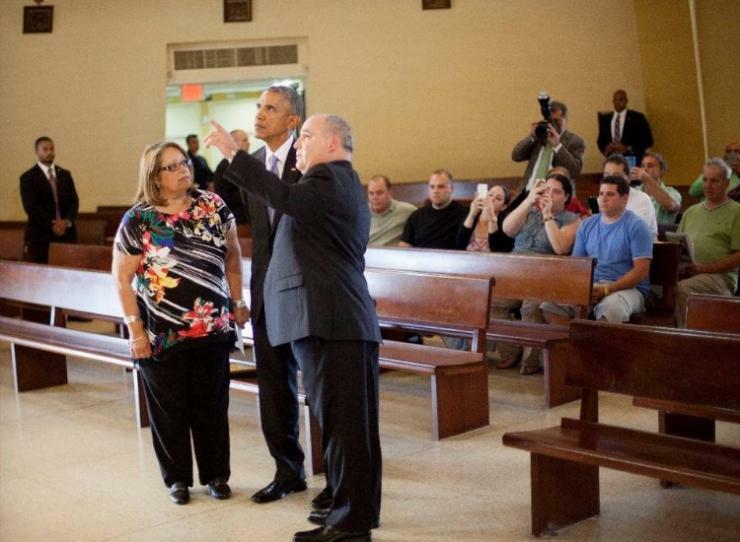 Father Juan Rumin Dominguez, rector of the National Shrine of Our Lady of Charity, welcomes President Barack Obama to the icon for Miami's Cuban exile community, which also has become a place of prayer and first stop of thanksgiving for many of the immigrants and refugees from Latin America who continue to arrive in South Florida. With them is Cristina Brito, secretary at the shrine, who served as an interpreter for Father Dominguez and the president. President Barack Obama listens as Father Juan Rumin Dominguez, rector of the National Shrine of Our Lady of Charity, explains the significance of the mural that adorns the main wall. Translating for them is Cristina Brito, secretary at the shrine. Seated in the pews are people who happened to be there praying when the president made his unscheduled stop before leaving Miami after a visit that lasted less than 24 hours. He had just concluded a visit to the National Hurricane Center in Doral. 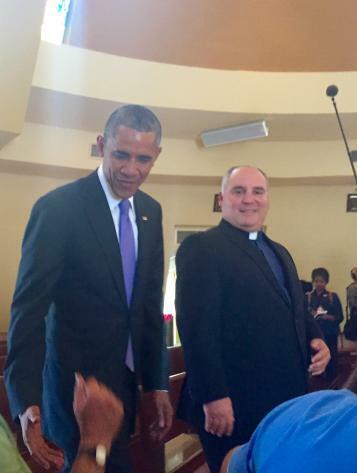 President Barack Obama listens as Father Juan Rumin Dominguez, rector of the National Shrine of Our Lady of Charity, explains the significance of the mural that adorns the main wall. Translating for them is Cristina Brito, secretary at the shrine. Seated in the pews are people who happened to be there praying when the president made his unscheduled stop before leaving Miami May 28. MIAMI | The priest prayed an Our Father. The president lit a candle. And while gazing together at a revered image of Cuba’s patroness, the priest reminded the president of the suffering of Cuba’s people. 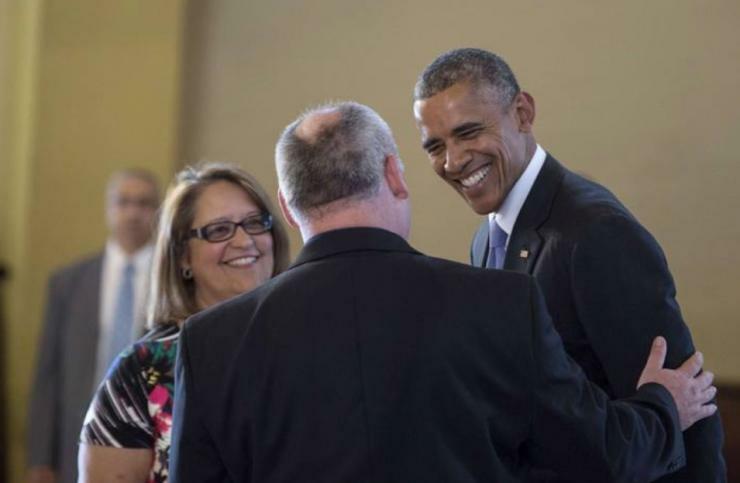 “Only in the United States that’s possible,” said Father Juan Rumín Domínguez, rector of the National Shrine of Our Lady of Charity, as he recalled the whirlwind, completely unexpected visit of President Barack Obama early in the afternoon of May 28. The president was on his way to the airport after attending a Democratic fundraiser the night before and spending the morning at the National Hurricane Center. The shrine: a symbol of faith and hope for Cuba’s exiles since before their donated pennies paid for its construction in the early 1970s; now a first stop also for thousands of immigrants from Central and South America who continue arriving in South Florida. Within seconds, carloads of SWAT-clad agents with bomb-sniffing dogs descended on the shrine, quickly and efficiently checking “every corner, every crevice, every door,” Father Domínguez said. He asked if he should tell the dozen or so people praying inside to leave. The agents said no. They just had to be screened with metal detectors. A few minutes later, Father Domínguez was standing at the glass doors of the shrine, waiting to welcome the leader of the free world. They walked inside, and with Cristina Brito, Father Domínguez’s secretary, serving as translator, the priest told the president the history of the place. “I showed him the image of Our Lady of Charity, the one that arrived here in 1961,” the priest said. The priest explained that the original remains at its shrine in El Cobre, in Santiago de Cuba. “I also explained to him the history of Cuba,” he said, a history depicted in the mural located behind the shrine’s altar. 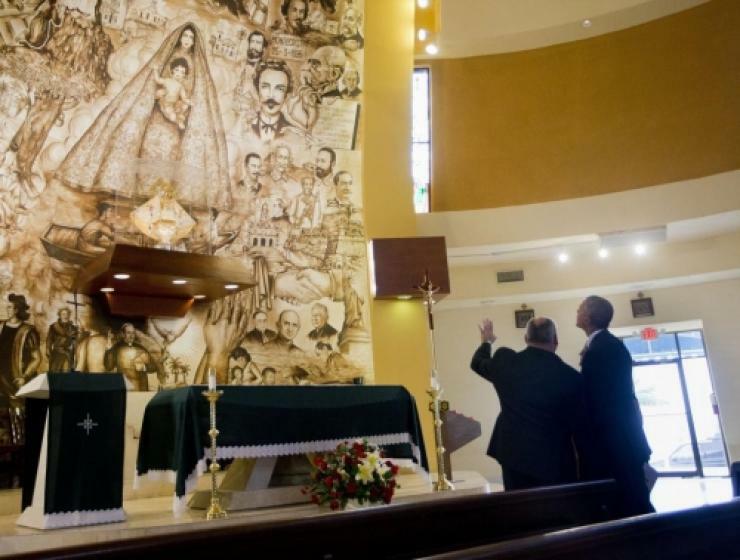 “He recognized Father Felix Varela and also José Martí,” Father Domínguez recalled, referring to two of the faces on the mural. One is of the priest who wound up ministering to Irish immigrants in New York after being exiled for demanding independence from Spain; the other is of the Cuban poet who died while fighting for the same cause. Then the priest pointed out the faces at the bottom right of the mural: Cuban rafters. Not content to say it only in Spanish, Father Domínguez said he repeated: “Mr. President, I have some difficulties in explaining myself in English. But I can say to you something very clear. We pray every day here for real freedom, real freedom, for Cuban people, for Cuba. Father Domínguez said he conveyed the feelings of many in the exile community who are wary of the current negotiations because they believe “this is all about economic interests,” and human rights are being cast aside. He said President Obama assured him that “the topic of freedom for Cuba and human rights will always be on the negotiating table with Raúl Castro." That’s when, together, the priest, the president and Brito prayed the Our Father. Then the president “lit a candle in front of the virgin,” Father Dominguez said, and stood for a minute in silent prayer. As for the faithful gathered there, the priest noted, "there was total silence in the shrine." He also pointed out the seawall — malecón in Spanish — built behind the shrine, which sits on the edge of Biscayne Bay. The wall is a small-scale replica of Havana’s famous malecón. 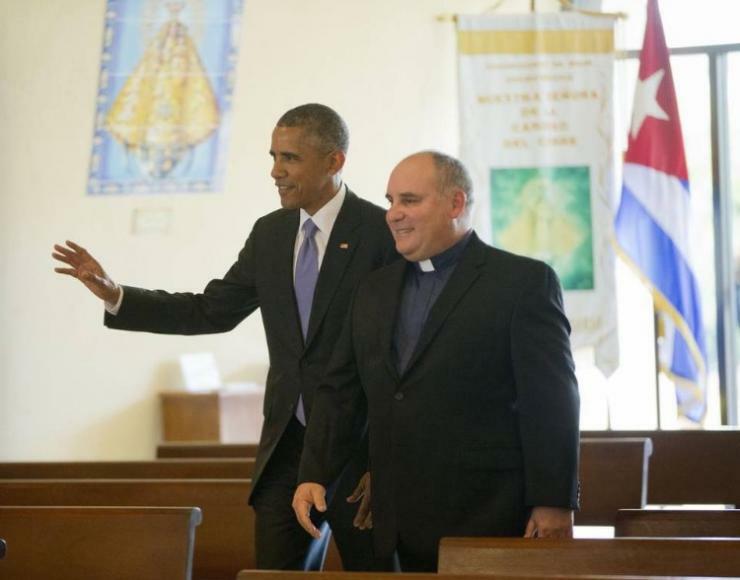 “Perhaps someday soon you will be able to see the original one,” Father Domínguez told the president. “I hope,” he said the president responded. 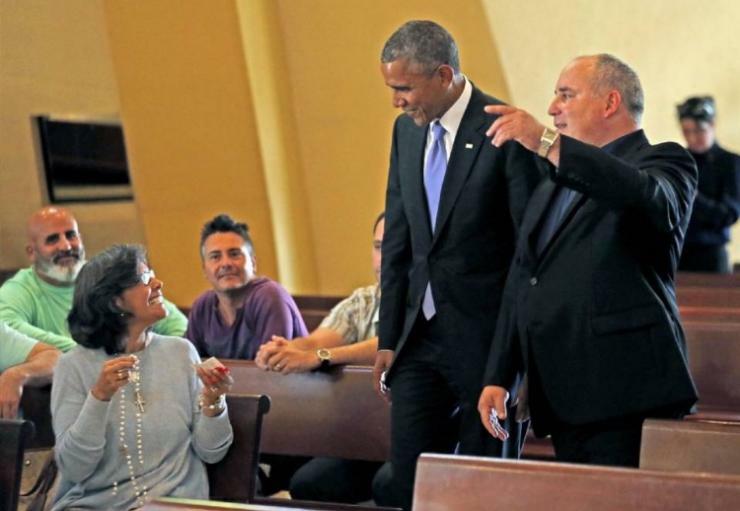 “The president is visiting the Shrine of Our Lady of Charity in Miami to pay his respects to the Cuban-American diaspora that worship there. He will honor the sacrifices that Cuban-Americans have made in their pursuit of liberty and opportunity, as well as their extraordinary contributions to our country. Obama visited the shrine, and the following day his government takes Cuba off the list of nations that promote terrorism and that don't respect human rights. That's cynicism.